It’s time to rock n’ roll at every UK casino there is online! 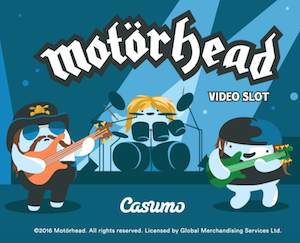 The thrilling videoslot called Motörhead was launched at Casumo yesterday and today you will be able to play the brand new casino game while you compete in a Reel Race. You can also grab some free spins if you’d like! If you for some reason haven’t heard of Motörhead yet we can recommend you to try this videoslot. This is the third and last casino game in the series called NetEnt Rocks. In January the provider launched Guns N’ Roses which was followed by Jimi Hendrix in April. And now it’s time for Motörhead! The rock gods will let you enjoy great design and amazing features such as Mystery Reels and Bomber feature. At Casumo you will be able to join Reel Races every 30 minutes – all day and all night long. The fun never ends. One thing that is good to know is that you can compete in a special tournament every night at 20:00. There will be a little extra at stake and first prize is £1000. However – sometimes when Casumo adds a new title from certain game studios they will double the prize! This is what you can look forward to tonight if you log in and compete at 20:00. And instead of £1000 the winner will go home with £2000. Maybe you’re lucky tonight but if you’re not you can always log in tomorrow at 20:00 once again and try again since there will be two Reel Races on Motörhead. You will never have to feel bored with an account at Casumo Casino that’s for sure. Like we mentioned earlier you will be able to claim bonus spins on Motörhead Slot at Casumo if you want to. But you have to be quick since the offer only will be available from 12:00 today until 23:59 tomorrow, the 24th of September. All you have to do is log in and you will get 5 free rounds on the new videoslot. If you would like some more free spins you simply have to make a deposit. By doing so you will be claiming another 20 free spins. To end your weekend in the best way Casumo gives you the opportunity to get Super Spins. If you want these valuable bonus spins you should log in and play all of your favorite games until you level up. Then you’ll be rewarded with Super Spins on The Wild Chase worth £3 per spin and you can win more than £3000 on one spin.